PLANET IGT-90xT Industrial Managed Gigabit Media Converter series extends communication distance with highly Gigabit performance via fiber optical wire, in which the extension distance could be up to 10km by applying IGT-902TS and IGT-905A (vary on SFP module) or up to 550m with the IGT-902T. The IGT-90xT series is specifically designed with durable components and strong housing case to operate reliably in electrically harsh and climatically demanding environments. The industrial level Gigabit media converter provides a high level of immunity to electromagnetic interference and heavy electrical surges which are usually found on plant floors or traffic control cabinets in sidewalk. Being able to operate under the temperature range from -30 to 75 degrees C, the IGT-90xT series can be placed in almost any difficult environment. PLANET IGT-90xT Industrial Managed Media Converter series efficiently converts data between 10/100/1000Base-T and 1000Base-SX / LX network, and offers remote management and monitoring capabilities. The IGT-90xT series provides the flexibility with all kinds of 10/100/1000Mbps Ethernet Media on RJ-45 port and performs highly stable Gigabit fiber performance. It also delivers the dynamic status report and real-time alarm messages that helps the network administrator to easily monitor and manage the entire industrial networks. For efficient management, the IGT-90xT Industrial Managed Gigabit Ethernet Media Converter series is equipped with remote Web / SNMP (Simple Network Management Protocol) interface. With the built-in Web-based management interface, the IGT-90xT series acts as an easy-to-use, platform-independent management and configuration facility. It also can be managed via any standard-based management software by supporting standard SNMP. Moreover, the IGT-90xT series can manage the remote client devices by the TS-1000/802.3ah OAM protocol (operations, administration, and maintenance). The IGT-90xT series can be programmed for advanced management functions such as IP address configuration, DHCP client function, port configuration, converter configuration, 802.1Q Tag VLAN, Q-in-Q VLAN, QoS, OAM control, Layer 2 protocol filter, broadcast storm control and Ingress/Egress bandwidth control to enhance bandwidth utilization. The enhanced management features offered by the IGT-90xT make it ideally suited for mission-critical and real-time control applications in the Industrial Ethernet networks. 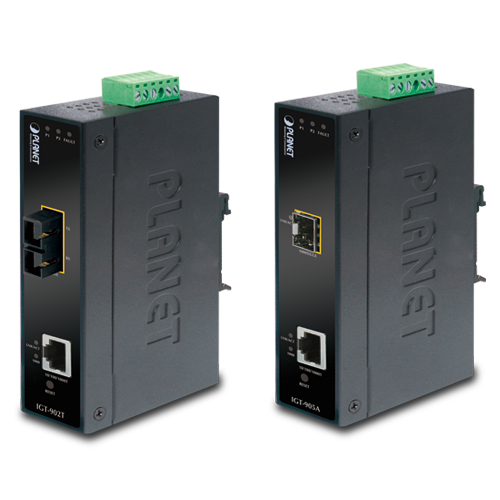 PLANET’s managed industrial Gigabit media converter, IGT-90xT series, offers high reliability and security to make sure the continuous industrial operation in harsh environments such as control cabinet of transportation, factory floors or the extremely low or high temperatures environments. In the industrial networking environments, each networked device is required to keep running continuously in the hazardous status. If industrial equipment fails to connect to the network, it might influence the entire operation of industrial systems, thus causing incredible financial loss. With the IGT-90xT managed industrial Gigabit media converter, which complies with all the requirements of industrial applications, customers may enjoy high reliability, fast recovery capability, and safe Ethernet network operation. With high performance of data transmission and easy installation, the IGT-90xT series Industrial Managed Gigabit Ethernet Media Converter can build an ISP network solution of FTTH (Fiber to the Home), FTTC (Fiber to the Curb) for ISPs, or FTTB (Fiber to the Building) for small office network environment in the enterprises. The Web Management interface of the IGT-90xT series enables network administrators to easily monitor and setup the converter, the transmission speed and duplex through web browsers. 2013-01-18 1.4b Release for IGT-905A supports 100Base-FX Fiber Optic Transceiver. 2012-04-10 1.3b 1.Fix when DHCP enable, the IGT-90x / IGT-90xT can’t get any IP address from DHCP Server. 2012-09-19 1.0 EC Declaration Release.